Day 1 is now in the books. Many things went as people would expect, but one huge surprise is Russia Open. 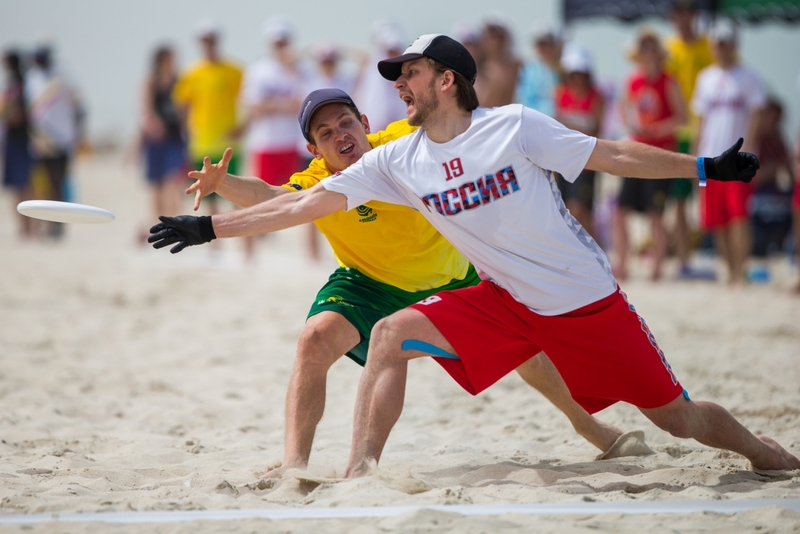 Russia have had two sudden death games games against traditional ultimate power houses, Australia and Canada. They went 1-1 on the day and here is a bit more about their first day at WCBU. Their first match was against Australia and it seemed like a really intense game with both sides really wanting to win. Australia may have been favored to win based on the seeding, but it was the Russians who came up with a couple breaks early on to set the pace for the game. 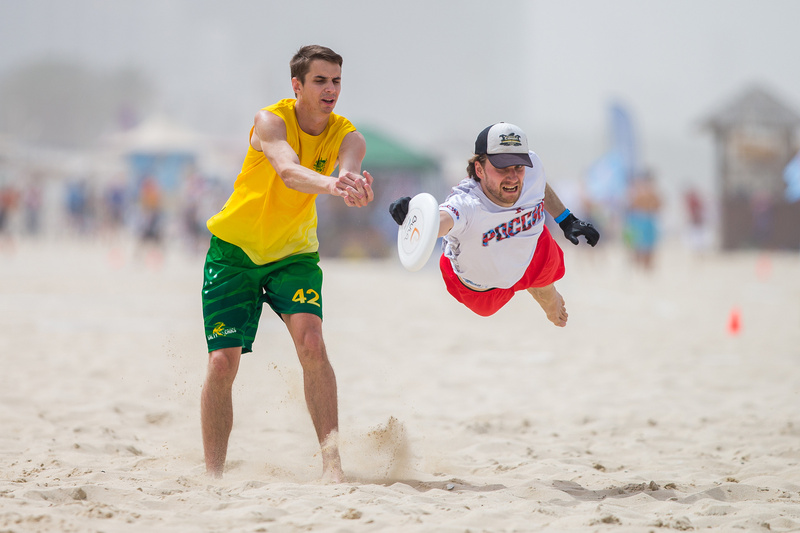 The Australians managed to get a couple breaks back and bring it to universe point, but Russia were able to score without too much trouble to put the game away in the upset of the day with a score of 11-10. Standout player and captain Ilya Dannenberg, was surprised that I even called the game an upset. Australian captain, Alistair Don, was also thrilled about the game. In the spirit circle he emphatically said, “I’ve never played a Russian team before. That was a lot of fun.” They think that lack of practice was an issue for them as the team just got together for this tournament from all different parts of the country. Don went on to tell me, “We are from all over the country and some players from around the world so we haven’t had a chance to really play together before this week. Early in the game we managed to get blocks but couldn’t convert them to get the points on the board. They got 2 breaks and managed to hold them all the way until the end. We got one back in the end but it wasn’t enough.” When asked how he was able to come back in the end of the game, he said that he thinks that the Australian team was fitter and was able to gel a bit late, but couldn’t overcome the buffer that the Russians put on them. In their second game the Russians had to take on Canada. I heard about the game from another field and was told that the Russians were leading against Canada so I sprinted over and when I got there the game was 7-7, with Canada having the advantage of serve. However, Russia broke back off of a quick turnover from Canada and were able to take the lead 9-8 before the cap went off. Canada scored again and gave the Russians another universe point situation. The Russians seemed poised and confident and put up a huck that looked like it would seal the game for them, but out of no where, Antoine Genest from Canada put his body on the line and had a huge layout block injuring himself and giving Canada the chance to finish the gam out. A huck went up and Rumi Tejpar caught the score to give Canada the win 9-10. 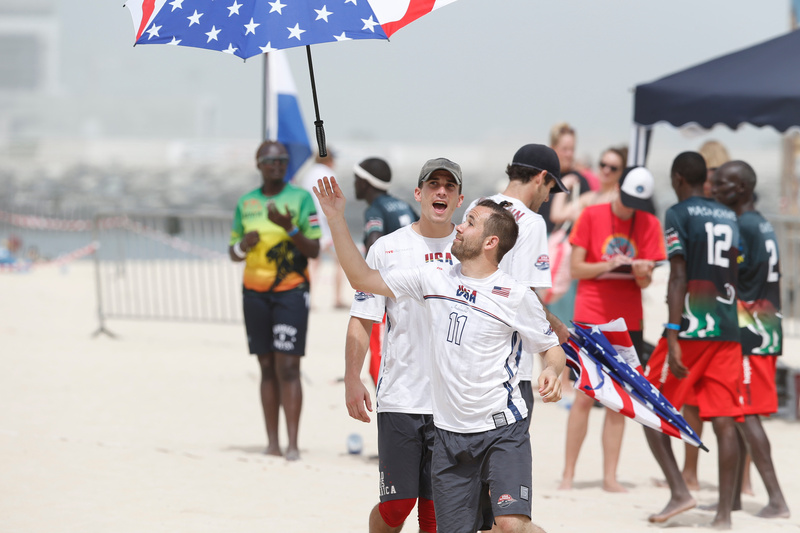 The Russians told the Canadians that playing them was an honor but Canada captain Alex Davis was quick to point out that the honor was theirs as Canada is still new to this beach game. 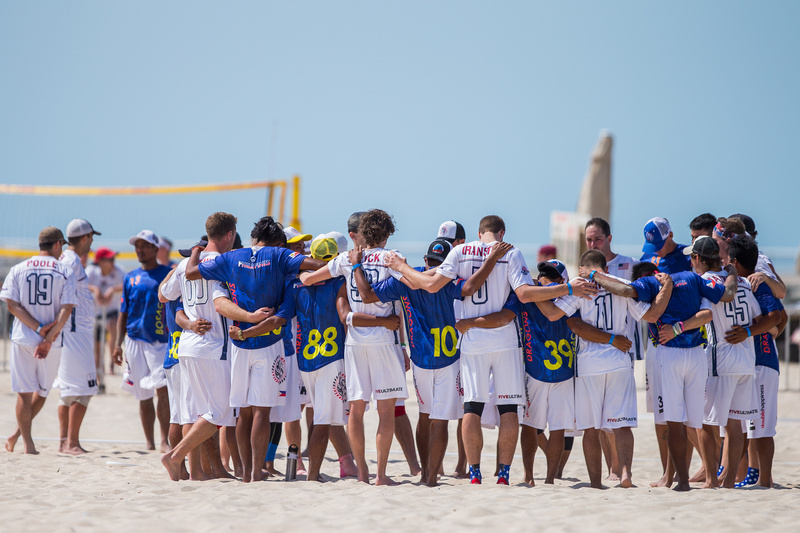 He told me, “Canada is still very much a country where we are students of the beach ultimate game. 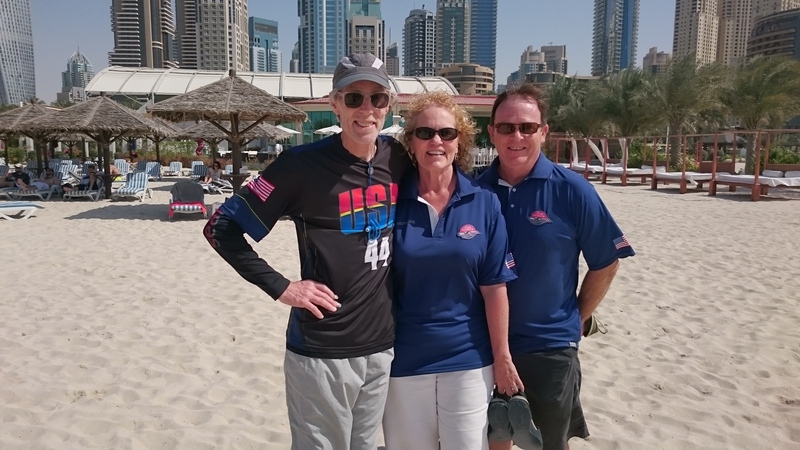 We are generally very good at ultimate, but we don’t spend enough time thinking about how the team adjusts on sand.” He was also really impressed with their play. “They routinely brought it out against us, [Dannenberg] in particular just schooled us. They had blade hucks with startling precision. In a cross wind on sand where you just have to be so precise, our strategy has been to choose the spot where you want the cutter to get it and just try to get the disc to sit there. They were throwing what I would have thought could not be completed to a running target on sand in a crosswind. We overshot several times to wide open people.” Russia seemed really disappointed by the loss. It just goes to show that the Russians fully expect to be winning these games even if the rest of the community is not. Russia has been developing a lot in recent years. This includes getting Sockeye to come over and give a big training camp and competing more and more at international levels. Looking at how they are dealing with competition on so little sleep it seems like they may actually be a contender for a semi-final spot. It will be interesting to see if they can sustain the energy they brought in the opening day to the rest of the weekend. Again, though many may see these results as shocking, the Russians, themselves, see it as totally normal. They are confident, strong and ready to take on anyone who comes in their way. Russia has traditionally had issues with spirit, but it seems that the open team is really working on it. 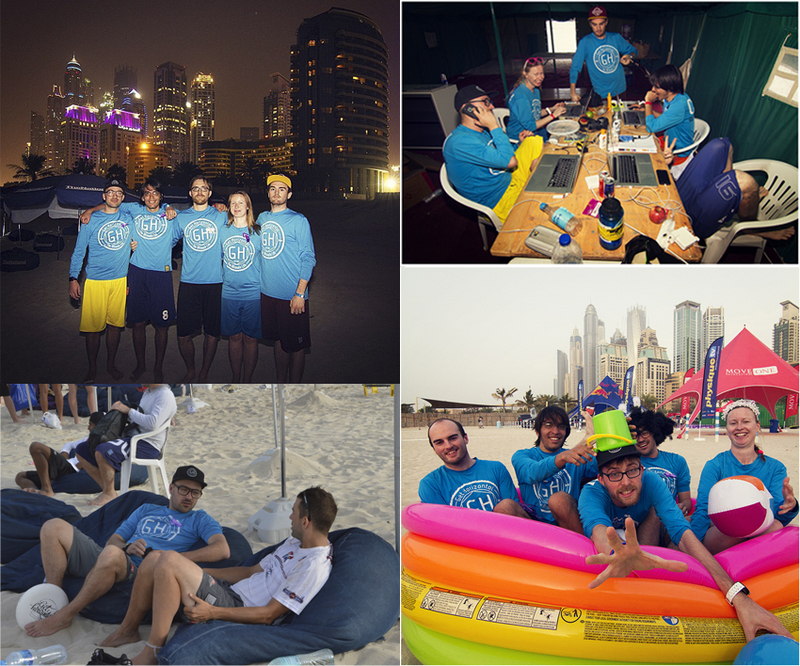 They repeatedly asked for feedback from opponents on their spirit in the game and have received nothing but positivity from Australia and Canada. On a final note it looks like the Russian women beat Canada in a game later in the day. They are firing on all fronts here on the beach. If they continue this success throughout the week they will definitely end up on more Beach Tales. Stay tuned. This Beach Tale was brought to you by Ravi Vasudevan of Get Horizontal. Featured image by Scott Roeder of Ultiphotos. Editor’s note: I had misattributed Ilya Dannenberg accidentally as Terekhov Mikhail. The article is now corrected.